An August 16, 2014 full-page column by renowned Wall Street Journal golf writer John Paul Newport cited the concern by tour great Tom Watson that the current rash of golf injuries among the pros may be coming from lifting weights in the gym. Newport described Tiger Woods as a prime example of a golfer who developed many injuries after lifting weights. "Since the 1980s," says Somax Performance Institute president Bob Prichard, "we have been warning golfers about the dangers of lifting weights to their backs and swings. Squats, lunges, dead lifts and leg presses all make the hips stiffer by creating scar tissue as lifting heavy weights tear individual muscle fibers. As these fibers repair, they do get bigger and stronger, but the scar tissue makes golfer stiffer in their hips." When the hips lose flexibility, they stop prematurely after impact, while the upper body continues to rotate, holding on to a club going 100 mph. All the stress created by the restricted hips goes in to the lower back. This is why Somax developed the Power Hip Trainer as a safe alternative to lifting weights. The moderate resistance of the steel spring at the base of the hip trainer does not create any scar tissue while it increases the strength of the muscles that rotate the hips. Since squats, lunges, dead lifts and leg presses do not involve hip rotation, the hip rotation muscles are not strengthened by lifting weights. 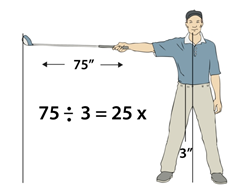 Due to the 1:25 ratio of the distance of the hip joints to the center of rotation and the 75" distance of the club head to the center of rotation, every increase in hip speed is multiplied 25X at the club head. This is why Somax guarantees a 25 mph increase in swing speed in 30 days with their Power Hip Trainer or money back. 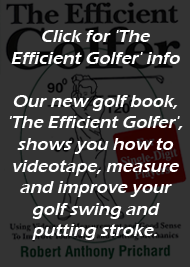 "Another benefit of the Power Hip Trainer," says inventor Bob Prichard, "is that it actually increases hip flexibility as golfers make 90-degree turns to the left and right while they increase their hip strength. Many golfers report a decrease in back problems." The Power Hip Trainer consists of a non-slip steel base to which is attached a special industrial strength steel spring. Two steel tubes allow adjustment for height and a padded steel hip cinch adjusts for hip size. The Power Hip Trainer comes with two DVD's showing all drills necessary for a powerful, fast and safe hip turn. 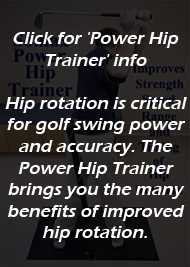 Golfers can purchase the Power Hip Trainer online by going to http://www.swing-speed.com/index.php The Power Hip Trainer is $275 plus $35 shipping by Fedex Ground. It comes with a 30-day money-back guarantee and a 1-year warranty on parts.